and the flurry and dusting of snowflakes here and there. and it takes me to that place and that feeling. P.S This painting, like most all of my paintings, is available in our McKinneyX2Designs ETSY shop as an original or in prints sized 11×14, 8×10, or 5×7 as well as boxed greeting cards. It will also be going with me to the Mars Craft Show on Saturday, November 17th! Lovely, the first snow is so magical, I am excited for it, even though the cold took me by surprise yesterday! Thanks Colin! You and Ray ready for winter? Absolutely beautiful, Jodi! You will sell that fast! Beautiful poem and water colour, Jodi! 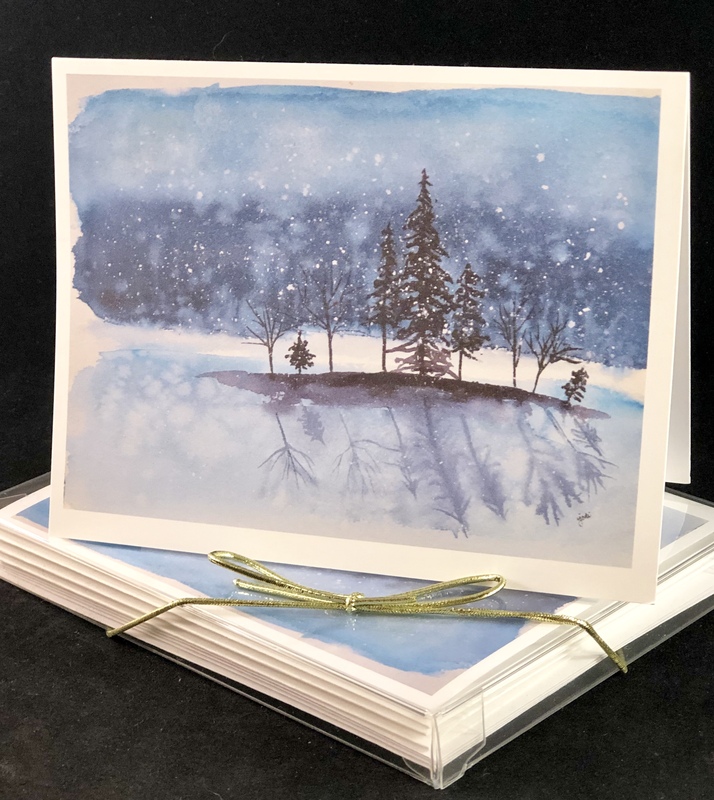 I noticed that you made cards out of your painting, which will make ideal Christmas cards. After the leaves have fallen and the earth looks bare, a dusting of snow is also welcome in our region too. Have a great Sunday, Jodi! are you anywhere near the fires Sharon? We are only a mile from the area that had to be fully evacuated. The high winds were blowing away from us, and it saved our area. Mother Nature is so powerful. Wow. So scary. So glad you are ok. I love the feel of this Jodi. LOVE. IT. It is indeed 🙂 Thanks so much Beth!! In need of this calm. Lovely scene, makes a fabulous card. Wishing you well next week we attended Holiday in the Pines a yearly event locally. I went out of my way to find gifts for Christmas by our local artist. I hope your community feels the same way. You have a lot of lovely things hope you take photos. Wish we had your snow to put out our California fires. Thanks for the sending me Calm today. Oh WOW! what a beautiful photo! and even though it isn’t winter, you are right – it is a similar feeling and composition! thanks for sharing!! Beautiful Jodi! I see what you mean about us both painting the same thing! We had our first cold spell this weekend, high 55 degrees…I went to my grandson’s baseball game and FROZE, it’s going to be a long winter! That winter scene is absolutely gorgeous. Well done. 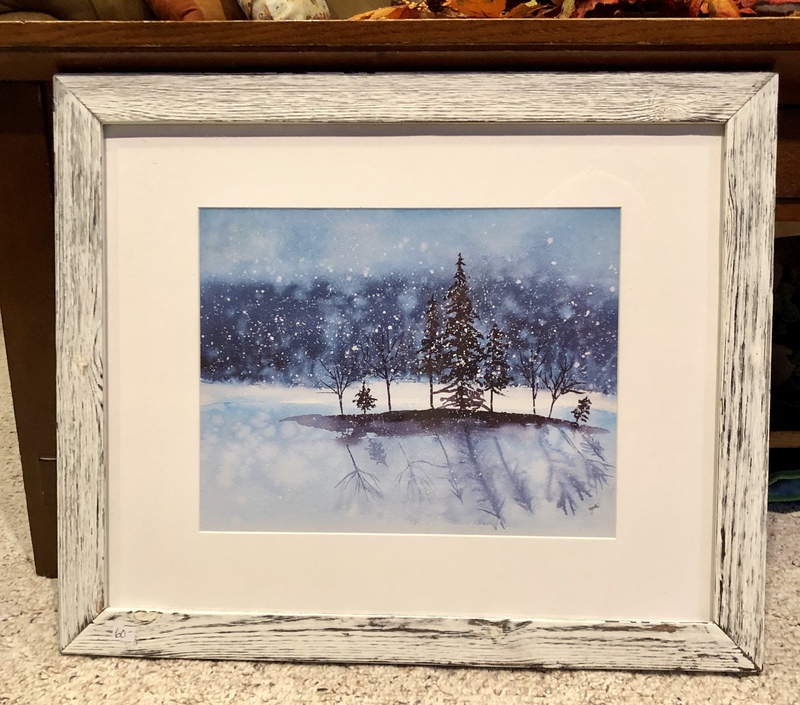 Your painting captured the beauty of Winter perfectly! (And believe me, acknowledging the beauty of winter is something that is hard for me to do at this point, since it’s very cold here and our furnace has been broken for two days now as we wait on a replacement part.) Thanks for reminding me that there is a lot to enjoy in this time of the year! Aww. Thanks Lynn! I’m glad it makes you feel good. That is what art is about huh? Fantastic painting 🙂 Such a soothing feeling it have. That is so sweet of you to say Jill. So funny about this one. I was not sure about it and kept it for about 2 weeks looking at it before I decided to share. LOL! As a New England girl living in Southern California, I’m a bit jealous of your frosty mornings!